The area is ideal for walkers, sailors, golfers, cyclists, birdwatchers and dog owners as well as holidaymakers, families and special occasion groups. 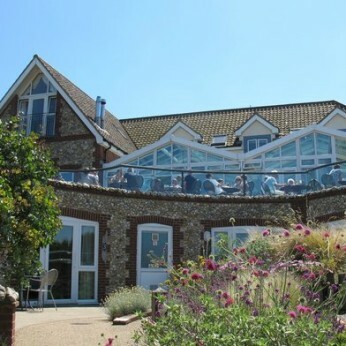 A friendly welcome is assured at this stylish, comfortable, tranquil yet bustling award winning establishment, full of Norfolk life – a true taste of Norfolk living. The bar offers a well kept selection of beers with real ale from Brancaster Brewery and also other East Anglian favourites, including Woodfordes Wherry, Adnams Bitter, Fullers London Pride plus a changing guest ale and a wide choice of wine by the glass or bottle from around the world. The locals bar has scrubbed pine furnishings and features photographs, historical of the area local village characters around the walls. With an inviting log fire in the winter and bar billiards, this certainly is the place to relax and have a drink and a bite to eat. Delicious breakfasts cooked with local produce are served from 9 – 11am. For any time of the day eating enjoy seasonal delights from the tempting bar menu which can be eaten at the bar or al fresco in the sunken garden area from 11am to 9pm. The bar is open for drinks at 11am to 11 pm Monday to Saturday and 12 noon to 10.30pm on Sunday. We are absolutely delighted to have received the regional award at last night's National Pub & Bar Awards 2018. It's a great honour and we are delighted for all our wonderful staff who have worked so hard to get us here. We are delighted to announce that we have been named county winner of the National Pub & Bar Awards! It's a fantastic achievement for us and all our staff, and is, of course, shared with all our wonderful customers.